Ringtones have been a very exciting and important feature for all of us who keeps a mobile phone and this gains much interest when you get bored hearing those common ringtones already placed in your cell phone. The word ringtones is commonly heard when someone is using an Android phone and he/she is keen to make it more exciting and fun. The first thing that you will hear from them would definitely be a ringtone, as these are those sounds which your cell phone plays when it rings during a phone call or a text message. 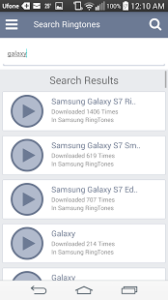 To add your favorite song tone as a custom ringtone may not be a bad idea and when you get them free of cost. 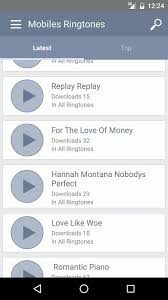 To help you download the top ever sounds i came up with a best ringtones application for Android which is available on play store referred with a name as “Mobiles Ringtones”. The app is produced by Watermelon tech co-related with its website http://www.mobilesringtones.com, the app is updated with a version 1.23 on January 18th, 2017 with current installation around 500,000-1,000,000 on Android. The best part of this application is its special tagging feature which you can use to seek for your desired free ringtone.Whether the goal is to change your Android ringtone to match your personality or to unearth a gaggle of new sounds and ringtones to assign a unique tone for each of your favorite contacts … you definitely need this app! Since not all apps are created equal, we tried and tested the top apps, those that are currently trending.